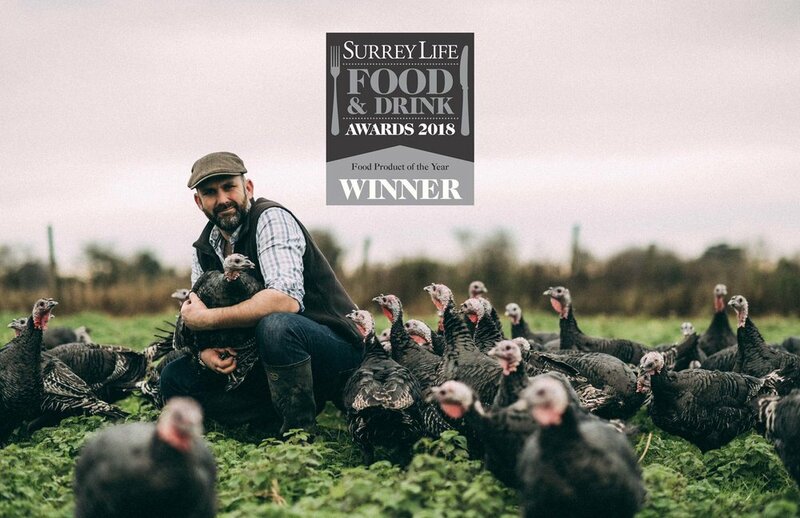 Surrey Life announced that Bramble Farm Turkeys - winner - of the “Food Product of the Year” award, having been voted for by readers and our customers. Tell us what it means to be a Surrey Life Food & Drink Awards finalist? Adrian Joy said: "We are humbled to even be considered for the Surrey Life Food and Drink awards and to win is incredible, we’re over the moon! We are a small family business started in 1929, now in a third generation, we produce slowly matured, free range turkeys, fed on the best GM free feed for Thanksgiving and Christmas. As soon as they can the birds are allowed to range freely in the fields – looking for grubs, pecking at grass or nettles. We supply selected retailers and sell directly from the farm in Horsley." A huge congratulations to all the finalists and award winners. They include Surrey’s best chef, coffee shop, restaurant and many more. To see the full list visit Surrey Life award list. Surrey Life award 2018 nominations and voting is now closed. If you didn't get a chance to nominate or vote, but love Bramble Farm Turkeys, we would love some customer reviews on Google & Facebook. Not written a review before? Here's how to post reviews on Facebook & Google. Need some inspiration of what to say? See some examples of reviews others have given.